Create a welcoming home with this sculptural sofa set, featuring fluid lines and a soft touch chenille fabric, exuding a sense of warmth that invites you to sit and relax. The generously padded cushions and armrests create a cozy look, making this sofa set ideal for those who value design and comfort. Includes a chair, loveseat, and sofa. This visually stunning set is undeniably comfortable, making it easy to create an inspiring home. Design your space with this contemporary sofa set. Featured in chocolate brown bonded leather, this reclining series is the set to complete your home theater in style. Sofa features a center flip down backrest with built-in cup holders. Both sofas have manual lever styled reclining footrests. 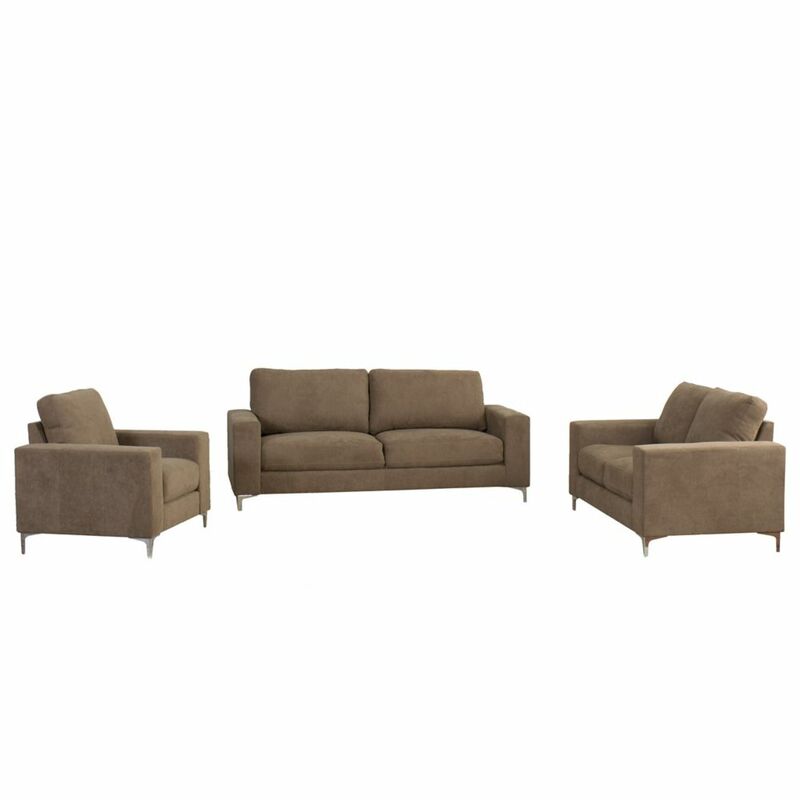 Entertain in comfort, this series is a quality product made with a durable wood and metal frame, supreme bonded leather and high grade foam filled cushions reinforced with brown top stitching. This set will give you years of enjoyment withstanding the test of time. Unwind in this plush reclining sofa and loveseat set. Feel the stress melt away as you sink into comfortable supportive cushions, upholstered in a soft touch chenille fabric. The sturdy wood and metal frame is engineered with a solid foundation ensuring the reclining mechanism works flawlessly for years. As a bonus, the middle seat folds down to reveal two cup holders, making movie nights with drinks easy. Unwind in this plush reclining sofa set. Feel the stress melt away as you sink into comfortable supportive cushions, upholstered in a soft touch chenille fabric. The sturdy wood and metal frame is engineered with a solid foundation ensuring the reclining mechanism works flawlessly for years. As a bonus, the middle seat folds down to reveal two cup holders, making movie nights with drinks easy. Design your space with this contemporary sofa set by CorLiving. Featured in soft bonded leather with wide arms and accented with decorative chrome legs this set will make a designer statement in your home. Entertain with style, the LZY series is a quality product made with a durable wood frame, supreme bonded leather, high grade foam filled cushions all reinforced with top stitching. This set will give you years of enjoyment withstanding the test of time. Cory 3-Piece Contemporary Brown Chenille Fabric Sofa Set Create a welcoming home with this sculptural sofa set, featuring fluid lines and a soft touch chenille fabric, exuding a sense of warmth that invites you to sit and relax. The generously padded cushions and armrests create a cozy look, making this sofa set ideal for those who value design and comfort. Includes a chair, loveseat, and sofa. This visually stunning set is undeniably comfortable, making it easy to create an inspiring home.